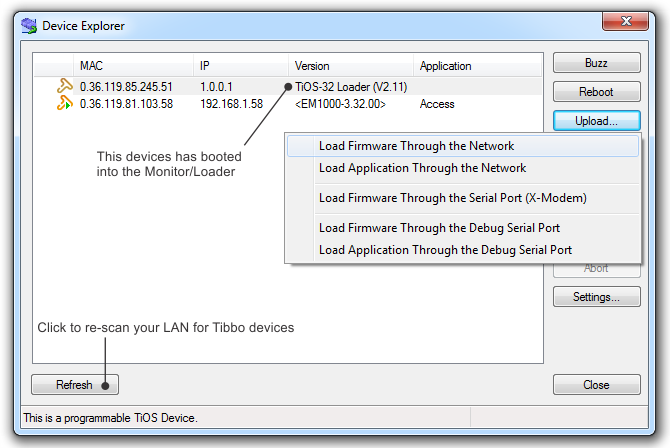 Ethernet firmware upgrades are supported by the Monitor/Loader of the following Tibbo devices: EM500, EM2000, EM2001, TPP2(G2), and TPP3(G2). This means that not every Tibbo device with an Ethernet port supports Ethernet firmware upgrades from the M/L. oYou may upload a TiOS firmware file combined with a compiled application binary. You can produce such combined files using our online tool found at http://apps.tibbo.com/bin_merger/ or using our legacy BinMerger utility (http://tibbo.com/support/downloads/tide.html). oEM2001, TPP2(G2), and TPP3(G2) devices have the RJ45 Ethernet jack. oEM500 and EM2000 require an Ethernet front-end (magnetics and RJ45) to be connected externally. If your EM500 or EM2000 module is "on its own" (not integrated into a host device), then the easiest way to connect it to the Ethernet LAN is by plugging it into an EV board. We offer EV boards both for the EM500 and for the EM2000 devices. •You will have to install our Device Explorer (DE) utility. You can install just the Explorer, or Tibbo IDE software (TIDE), which installs the Explorer along with it. Get the software here: http://tibbo.com/support/downloads/tide.html. •Optional: you will benefit from observing the signals displayed by Status Green, Status Red, and Ethernet Link LEDs. EM2000, EM2001, TPP2(G2), and TPP3(G2) devices incorporate the status LEDs. The EM500 doesn't have the status LEDs, but its EV board does. •After the device powers up, release the MD button (MD line). The Green status LED will turn on — your Tibbo device is now in the update mode. In the beginning, the device will enter the Xmodem serial update mode, but will quickly time out. After that, the M/L will proceed into the Ethernet update mode. If your device is connected to the Ethernet LAN (as it should be), it will "link up" and the orange Ethernet Link LED will turn on*. •Run the Device Explorer. Your device should appear in the list and its version should read "TiOS-32 Loader." If you don't see your device in the list, click Refresh to rescan the network for Tibbo devices. •Select your device in the list, click Upload, and choose Load Firmware Through the Network. •You will be prompted to select the firmware file. Select the file, click Open, and the upload will start. The Green status LED will be on and flicker infrequently during the file upload. •Once the upload completes your device will reboot automatically. * The arrangement is different on the EM500. First, the EM500 doesn't have any LEDs. You will need to plug the module into its EV board to see the LEDs in action. Second, the EM500 displays the link status not on a separate LED, but through the brightness of the Green and Red Status LEDs: these LEDs will become brighter when the Ethernet link is established. For more information, see the EM500 and EM500EV documentation in the Programmable Hardware Manual (PHM). •If the BLE update mode is supported by your device, the M/L will wait about 15 seconds for the Ethernet link to be established. If the link is still not on after 15 seconds, the M/L will proceed into the BLE update mode. •If the BLE update mode is not supported by your device, the M/L will be waiting for the link to be established indefinitely.